The Wicomico County Detention Center, the largest detention center on Maryland’s Eastern Shore, was designed by EI Associates. Using cast-in-place concrete columns and beams, pre-cast concrete infill panels and concrete masonry units, and consisting of 105,000 g.s.f. of floor area, constituted the actual detention center facility. The facility has the capability of housing 428 males and female inmates. The facility was subsequent expanded that added new facilities for Training and Management, Inmate Program Space, Female Housing, Central Booking, Bond Commissioners’ Suite and Wicomico County Emergency Management Services 911 Communications Center to the southeastern corner of the existing detention center. This was the first phase of possible other future expansions. 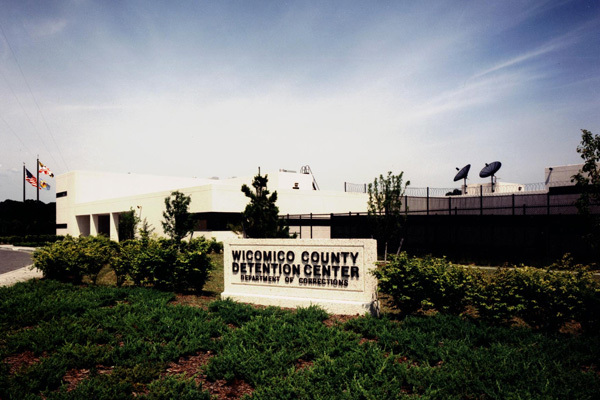 There are seven distinct housing areas comprising the Wicomico County Detention Center. The latest Central booking addition accommodates Male and Female Holding Cells as well as Medical/Suicide Watch Cells. Three separate, two-level housing blocks are separated in order to accommodate either male (2 blocks) or female (1 block) inmates. There is a Special Male Inmate Housing Area consisting of segregation cells, administrative segregation cells and mental health segregation cells. Lastly, there are two separate Work Release Dormitory spaces one for male work release detainees and one for female work release detainees.